WorldwideBrands has Millions of Dropship Products – From 100% Certified Wholesalers. 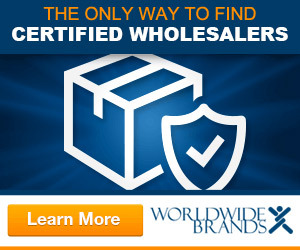 Since 1999 World Wide Brands’ Directory has been providing online sellers with top-level Certified Wholesalers that you can use to sell products on Amazon, Ebay or in your online stores. Feel free to watch the videos on the following topics. 4. Wholesale prices are not public info! 11. What is the Manufacturer’s Advertised Price? 12. What is the MSRP? 13. What is the Minimum Order Quantity? 14. What is Quantity on Hand? 15. What is Free On Board? 16. What is Net 30? 17. What is a Return Authorization? 19. What is Buying at Cost? 20. What are Trade References? big box stores. There is a one time free of $299.00 to access all of these companies. Files are available to download to add to a shopping cart. To Get Started Click Below! Techno-babble inside and out, and what it all really means in plain English! If you want to find out more information for free, Click Below! !